Why Is The Country's Largest Auction House Selling A "Ty Cobb Signed" Baseball That Wasn't Made Until 15 Years After Ty Cobb Died? 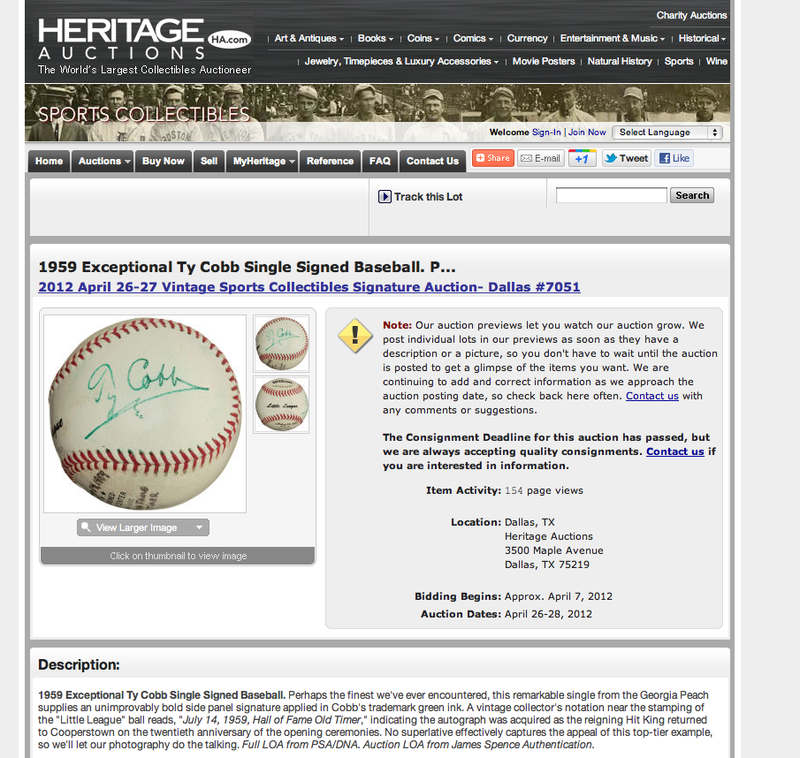 Heritage Auction Galleries in Dallas is currently offering a "miracle ball": a "1959 Exceptional Ty Cobb single signed baseball." (UPDATE, 6:40 EST: They pulled the auction. Screengrab is here.) The auction house listing describes the official Little League ball as, "Perhaps the finest we've ever encountered, this remarkable single from the Georgia Peach supplies an unimprovably bold side panel signature applied in Cobb's trademark green ink." The ball is a featured item in Heritage's upcoming April auction and certified genuine by the two major authentication outfits PSA/DNA and JSA and according to them, "The autograph was acquired as the reigning Hit King returned to Cooperstown on the twentieth anniversary of the opening ceremonies. No superlative effectively captures the appeal of this top-tier example, so we'll let our photography do the talking." Such a piece of Cobbabilia might fetch over $30 grand at the auction, but don't go sliding with your spikes high for this one. It's Fake, Fake, Fake like one of Elaine's Seinfeldian orgasms. The auction house and the authenticators PSA/DNA and JSA seem to have overlooked the "Leather Cover" stamp on the ball manufactured by Wilson. Baseballs used to be made strictly of horsehide until the mid 1970s when companies changed over to cowhide. Sean Flynn from Wilson told Deadspin that the company's baseball manufacturing engineer confirmed that the ball allegedly signed by Cobb in 1959 was actually "made in the 1970s." A leading expert on baseballs, Brandon Grunbaum of Historyofthebaseball.com took a look at the ball and told us, "That would be a pathetic attempt at calling that ball 1959. The Wilson logo is the modern logo, not the logo used in the 1950s and 1960s. And the punch holes are too large and split which is a dead giveaway for a cowhide cover, not horsehide which is post 1977. There's so much wrong with the stamping and ink to be 1959 it's not funny." 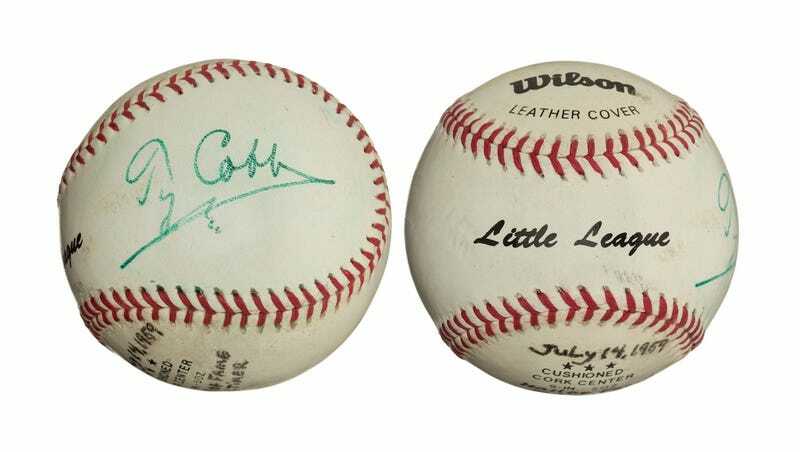 Lots of tall tales have been told of Cobb's alleged stabbings in back alleys and beat downs in the ball yard, but this is the first time he's come back from the dead to sign a Little League ball made 15 years or so after that funeral none of his peers allegedly showed up for. Heritage is right when they say "no superlative" could do justice to this gem of a forgery. Click here to read more about the cesspool that is the memorabilia industry. Peter Nash, formerly Prime Minister Pete Nice of Def Jam's 3rd Bass, is the author of two baseball books and also writes for Haulsofshame.com. He is currently working on his upcoming book, Hauls of Shame: The Cooperstown Conspiracy and the Madoff of Memorabilia.